During the past 63 years, Amma has verily revitalised the spiritual ethos of modern India and strengthened the moral fabric of society through the power of her unconditional love, spiritual wisdom and transformational motherly embrace. Amma’s charitable work—providing food, shelter, medical care, education, etc, for the poor and downtrodden—is an example of selfless service, par excellence. Likewise, Amma’s No. 1-ranked private university is a wonder of scientific research that directly benefits the poor.Amma’s birthday is a joyous celebration of all of these glories and much more—a confluence of devotees and well-wishers from around the world celebrating an embodiment of unconditional love and selfless service. It is also an occasion when many of Amma’s new humanitarian projects are unveiled and existing ones are extended. It would be wonderful if you were able to grace this event with your invaluable presence. We sincerely hope you will join us. Amma has also pioneered countless humanitarian and charitable programmes in India and abroad under the “Embracing the World” initiative. Amma’s upcoming 63rd birthday celebrations is to be held at the Amrita University Campus at Amritapuri, Kerala on the 26th and 27th of September, 2016. 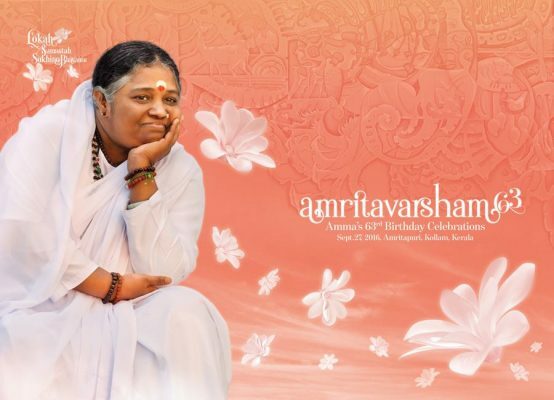 © 2013 Mata Amritanandamayi Math.